At 1:30pm pick up from the Hotel; guided sightseeing tour in Cusco such as: the Qoricancha (Temple of the Sun), which displays the best Inca stonework in the city, and the Cathedral in Cusco's Main Square with its magnificent colonial art. 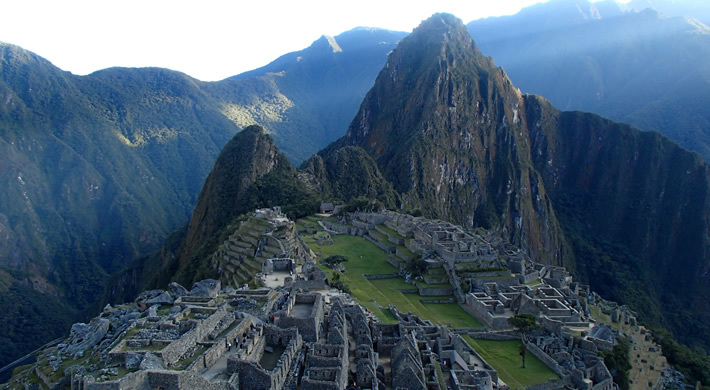 Go to the outskirts of the city to see the Inca ruins. Saqsahuaman, the amphitheatre of Qenqo, the fortress of Pukapukara and the spring shrine of Tambomachay.Overnight at the Hotel in Cusco. We travel out of Cusco in our private transportation until the village of Maras.Maras is a nice little town that still keeps a good part of its architectural colonial beauty. You can see amazing facades made of thin stone, lintels with sculptures in bas-relief. You will be taken to the bus stand at 5:30 am from where you will be driven a short distance (25 minutes) to the Machu Picchu or "Old Mountain". Upon arrival, you will participate in a guided tour of the Citadel, where you enjoy a spectacular view of the city enigmatic, visiting the Main Plaza and fountains, the Circular Tower, the sacred sun dial (the most important preserved Intihuatana), the Temple of the Three Windows, various burial grounds ,urban and agricultural sector. After the entire tour is complete, you will have enough time to wander around this Archaeological Site. Lunch at a local restaurant. Afternoon: return by bus and train to Cusco.Overnight at the Hotel in Cusco.